Lumbosacral disease involves degeneration of the lumbosacral junction and/or compression of the associated nerves. The lumbosacral joint is one of the highest-motion joints of the spine. As a result, it is uniquely predisposed to degenerative (wear-and-tear) diseases that are similar to the diseases causing lower back pain in humans. The lumbar spine is highly mobile whereas the sacrum is immobile, hence the lumbosacral junction is a transition zone and subsequent stress is placed on the joint and the lumbosacral intervertebral disc. 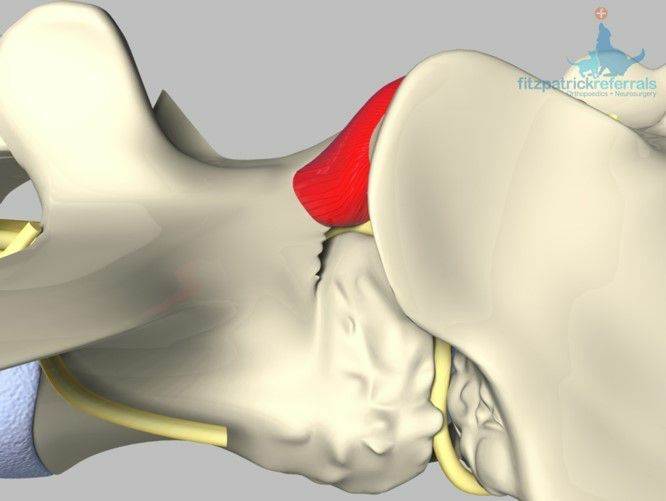 Disc degeneration may arise leading to disc protrusion or tearing. Compression or impingement of nerves as they travel dorsal to a disc or exit the spinal cord at the nerve root foramina occurs as a result of the bulging disc, soft tissue proliferation, collapse of the foraminal area (foraminal stenosis) or new bone formation. This compression leads to discomfort, the canine equivalent of sciatica and with progression further compromise to nerve function. Lumbosacral Junction illustrating the lumbosacral disc in light blue and the nerve root in yellow. Early stage lumbosacral disease illustrating mild degeneration of the lumbosacral disc. Severe lumbosacral disease illustrating impingement and compression of the lumbosacral nerve root. What is the lumbosacral junction? The lumbosacral junction is the juncture of the last lumbar vertebra (L7) with the sacrum (where the spinal column meets the pelvis and back legs). At this junction, as between all vertebrae, are bony articular facets that articulate to form two small joints and an intervertebral disc – a cushion of gel-like cartilage – that acts as a shock absorber during physical activity. A nerve root exits the spinal cord at the foramen between L7 and the sacrum on either side which contributes to the sciatic nerve, the main nerve to the back legs, while other nerves (“the cauda equina”) continue to run within the spinal canal, encased by the vertebral bones, contributing to tail and urinary bladder function. How do I know if my dog has lumbosacral disease? Affected cats can experience difficulty jumping and crabby behaviour associated with lower back pain. The precise nature of these problems depends on which nerves are compressed, and the severity and duration of compression. Occasionally we also see younger dogs (often Border Collies) with subtle clinical signs such as poor performance during agility training. How is lumbosacral disease diagnosed? 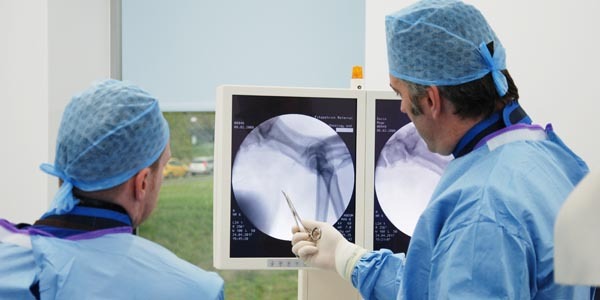 A detailed clinical examination by an experienced veterinary orthopaedic surgeon or neurosurgeon is central to the diagnosis of lumbosacral disease. 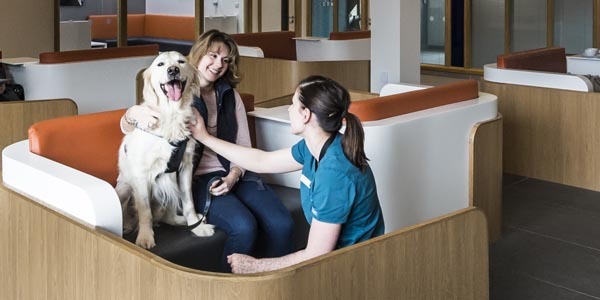 At Fitzpatrick Referrals, we have a team of orthopaedic clinicians and neurology clinicians who are very experienced at managing dogs, and cats, with LS disease. Confirmation of the diagnosis is made using an MRI scan which is performed under general anaesthesia by our advanced diagnostic imaging team. 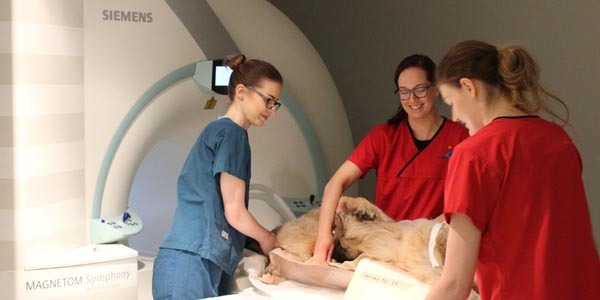 Your pet will have dedicated one-to-one care during their MRI scan by one of our nurses from the prep nursing team who are all trained and experienced in anaesthesia and sedation. Electrophysiologic studies (EMG) and survey radiography provide adjunctive diagnostic information. An accurate diagnosis is essential as the clinical signs can be very similar to those seen with other diseases including hip dysplasia, other lower back problems, or even medical problems. MRI image of the lumbosacral spine illustrating degenerative and compressive changes in the lumbosacral junction. How is lumbosacral disease treated? The best treatment for lumbosacral disease depends on the cause and severity of the problem as well as the site of the nerve compression. Your orthopaedic or neurology clinician will advise you of the most suitable treatment for your dog on an individual basis. Exercise modification – absolute rest in the short term and modified exercise in the long term. Anti-inflammatory medications – either supplied for oral administration or injected into the affected area. Physical therapy, manipulative therapies, laser therapy, ultrasound therapy. 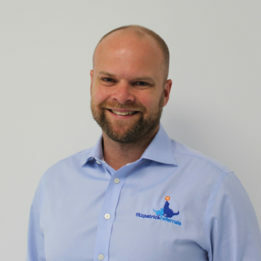 Shockwave therapy – we are the first practice in the UK to offer a small animal dedicated shock-wave treatment service. The technique is used widely in human and equine patients and has been shown to produce significant benefit in many cases of recalcitrant back pain and other conditions. Hydrotherapy – we have a heated pool and trained hydrotherapists to supervise swimming sessions. A good analogy for the intervertebral disc is a jam doughnut. Disc disease can involve either extrusion (akin to the jam squeezing out) or protrusion (akin to a bulge in part of the spongy part of the doughnut). 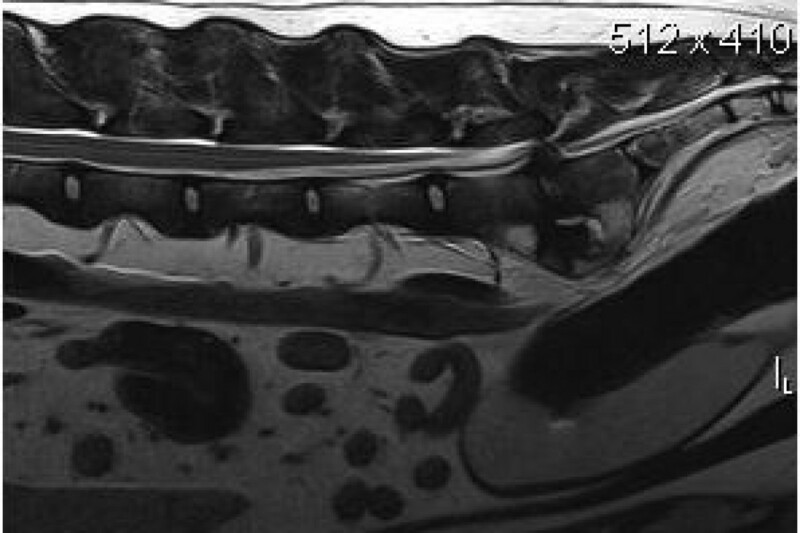 For dogs affected only by extrusion or protrusion of the intervertebral disc with no evidence of instability or compression of the nerve roots, surgical decompression by dorsal laminectomy may be appropriate. 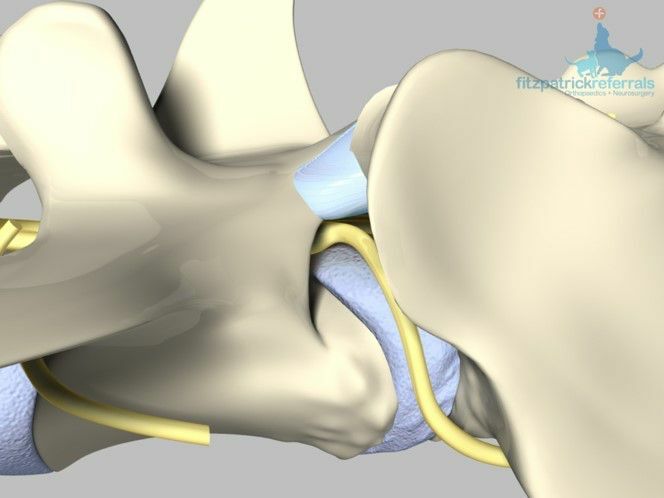 This involves removal of some of the bony casing of the spinal canal, allowing the surgeon to remove any bulging or ruptured intervertebral disc material that might be compressing the cauda equina. 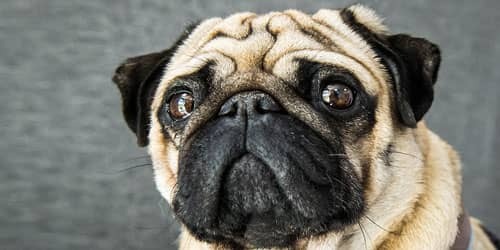 Over recent years, we have developed an extremely effective surgical treatment for dogs with lumbosacral disease where compression of the nerve roots is present, and pathological lumbosacral instability is suspected. 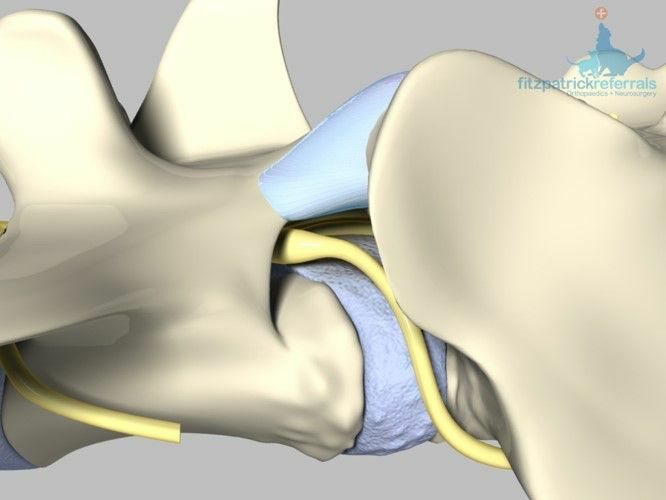 This technique involves distraction (stretching) of the lumbosacral joint by placing a custom made titanium bolt between the vertebrae, and provision of additional stability using either pins and bone cement or a pedicle screw system similar to the systems used in human spinal surgery. Dorsal view of the lumbosacral distraction stabilisation surgical technique developed by Professor Noel Fitzpatrick. 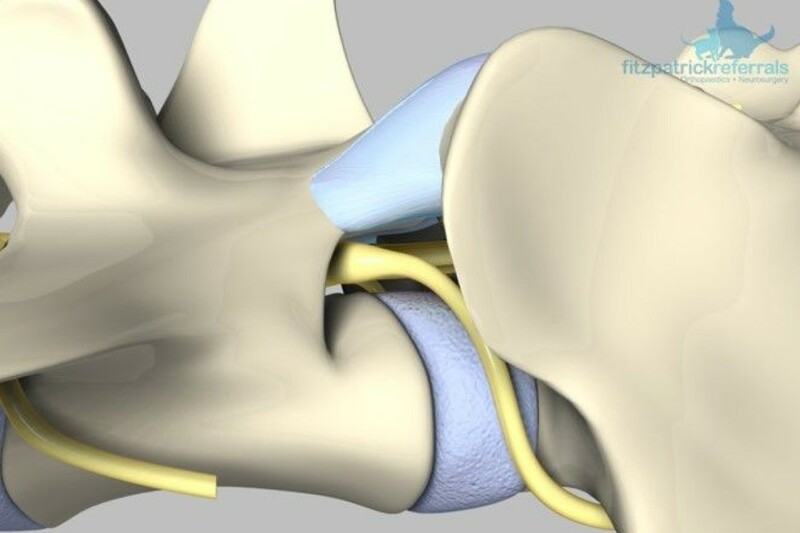 Lateral view of the Lumbosacral distraction stabilisation surgical technique developed by Professor Noel Fitzpatrick. This combined treatment immediately relieves the compression on the nerves, stabilises the lumbosacral junction and encourages the lumbosacral joint to fuse, halting lumbosacral disease progression. High-quality postoperative care is particularly important to avoid complications and to allow full rehabilitation after surgery, and our chartered physiotherapists are frequently involved with postoperative management of patients undergoing this type of treatment.